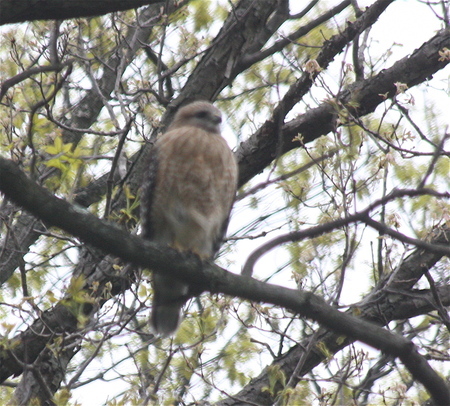 Some sad news on the red-shouldered hawks that have been nesting in a sideyard near the Allendale-Ramsey border. They are the pair that formed after the first female was injured (and rehabbed). Marsh Warden Stiles Thomas found a dead two-week-old hawk chick on the ground about five yards beyond the nest. It is unclear if there are other chicks remaining, but these hawks have had a low percentage of success. I don't like to post bad news on this blog, but this does serve as a reminder of how tough it is for wild critters -- especially threatened species like red-shouldered hawks. One continuing along the main path for the 4th consecutive day, and another down the Blue Heron Pond trail. Had brief looks at both of them. A minimum of 3! singing MOURNING WARBLERS are present at the Celery Farm today! One continues for its 3rd consecutive day along the Allendale Brook, another (found by Fred Weber) in the LeConte's Lane/Barking Dog Corner area, and a 3rd at Greenway/Phair's Pond. I only heard the first 2, but the Greenway bird was most cooperative as it popped out for some wonderful looks as it fed/sang near the top of a large bush about 15 feet high! In this same bush I discovered a YELLOW-BELLIED FLYCATCHER -- only my 2nd spring sighting at the CF! This bird was extremely cooperative as it sat in the bush and preened. It also gave its distinctive, soft, "Pur-wee" call a number of times. Other highlights included a singing 1st-year Orchard Oriole, a Least Fly, and a heard-only Alder Fly -- making it a 4-Empid day for me! Click "Continue reading..." below for the full report. The five owlets are getting bigger, and so are their appetites. Features a slo-mo feeding frenzy. Not for the squeamish: food chain footage. COMING FRIDAY: Another feeding frenzy, and Mom intervenes.